Extracts coolant from your vehicle’s cooling system. Stores coolant while you service your vehicle. Injects coolant back into the vehicle. Eliminates trapped air from the cooling system. 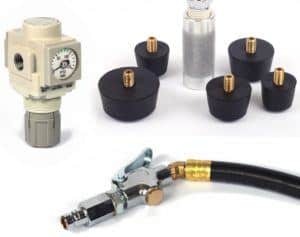 The 2V-700 Coolant Extractor from FluidXchange connects to your vehicle through a quick disconnect fitting found on the bottom of the radiator or some other location low on the vehicle’s cooling system. 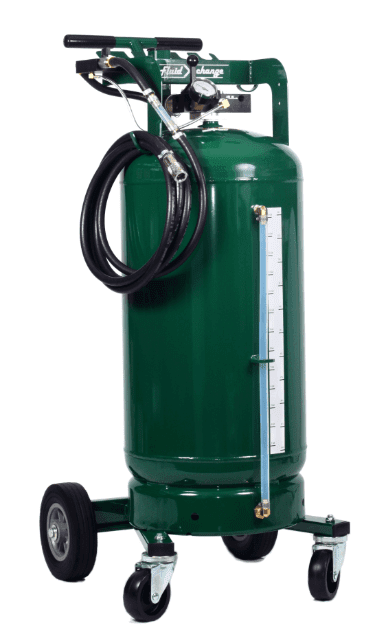 The 2V-700 uses your shop air supply and a built-in vacuum generator to decrease the pressure inside its tank. This partial vacuum is used to extract coolant from your vehicle. Your coolant is kept safe and clean inside its tank while you perform service on engine components such as EGR valves, EGR Coolers, water pumps, hoses, etc… When service is complete, you pressurize the Coolant Extractor so it can inject coolant back into your vehicle from the bottom of the Cooling System which eliminates most of any trapped air. Then one additional step is taken to extract any remaining trapped air so the entire cooling system is completely refilled. Saves Time… Coolant Drops are fast & efficient because everything you need to connect to the Vehicle’s cooling system is right on the Tool. Coolant Flow rates in and out of the Tool allow for transfer times around 5-8 minutes. Saves Money… because extracted coolant can be reused. Also the reduced time to extract & refill coolant allows for faster service through-put and lower Service Technician time & cost. Keeps your shop clean… the unique “closed-loop” system contains the Vehicle’s coolant and eliminates spills. This keeps the work area much cleaner and easier to work in. Keeps your coolant clean… the Vehicle’s coolant is drawn into the Coolant Service Tool’s tank, held during Vehicle Service, and pushed back into the Vehicle without ever coming into contact with external contaminants. 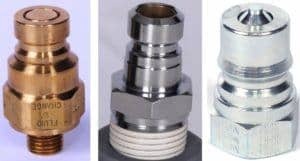 We also have available 27 Gallon Storage Tanks that work with the Tool utilizing the same Quick Disconnect Fittings & Couplings. This allows the Tool to be switched to other Vehicles during the Service interval. Protects your technicians… the use of our Coolant Service Tool greatly reduces the exposure of Service Technicians to hot coolant and any chemical exposures. The robust Coolant Service Tool can handle both the volume of Coolant being extracted and the hot temperatures. Protects the environment… eliminating any coolant spills in the Shop Area greatly reduces the chance any Vehicle coolant/antifreeze will be washed down the drain and impact water treatment facilities or ground water. Our system also protects the Company from any liabilities associated with unlawfully washing untreated engine coolant down any waste-water system.